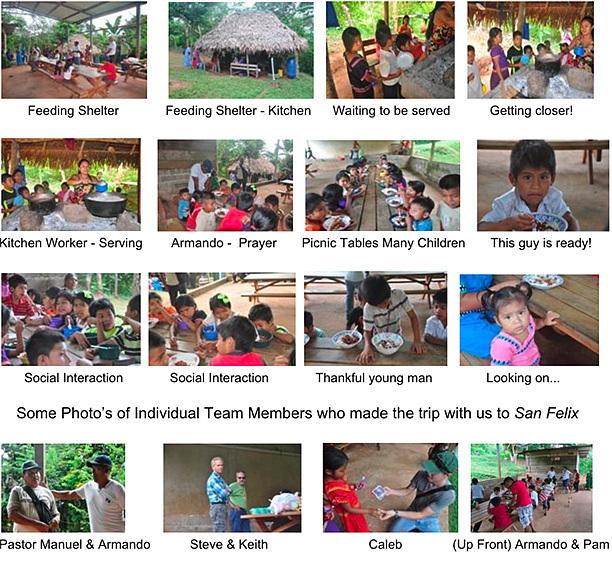 Our concentration of activities these past few months have been to the San Felix area. The Children's Feeding Shelter in the Oma district of the Ngobe Commarca has been a main focus of our efforts. We are including numerous photos of the continuing program that was started by Villa Bethel about 20 years ago. Cleft Of The Rock Ministries is presently taking on the responsibility to sustain this feeding program and meeting needs of these Ngobe Children for at least a year. We were blessed to have Keith and Pam Vaness, Caleb Eash, and Steve Plummer join us. Armando from Casa Esperenza did some coordination and interpretation for us. The photos below exemplify the ongoing program. This outreach to San Felix was highlighted as a Special Event / Christmas Celebration, as this was the last week of school before Summer Vacation; meaning that many of these children may migrate with their families to pick coffee in the outreach areas where it is grown .They also pick vegetables in the Volcan area. What made the event special was the distribution of “apples”, a real treat for the children as well as toothbrushes and toothpaste for hygiene. Pam & Keith Vaness were instrumental in distribution of individual prepackaged small toys and gospel message for boys and girls. There were many happy children! Armondo’s wife and daughter and 2 grandchildren,and Steve’s son, also accompanied us to the San Felix Feeding Shelter. I was sorry that Jane was unable to go with us as she had broken her right ankle the end of September and was still recuperating after the intense therapy. The road to the Feeding Shelter is very rugged with about 1/8 mile hike uphill with small rocks and washed out crevices, so it was about impossible for her to go that distance and put herself at risk. The construction of the Food Pantry for the Feeding Shelter is about to be started near the end of January in the dry season. This has been in the plans for some time.It will take several days to build- plus obtain needed materials such as sand cement, stone, cement blocks,and a secure door.We are lining men up to help build it.San Felix is 2 hours from Boquete and we have some men from Boquete who are wanting to help. We continue to help with school supplies for the Ngobe children in Soloy as needed also. Thank you for your continued support and may you enjoy a Prosperous New Year!